We have a wonderful, large and enclosed garden, our ‘outdoor classroom’ which we access on a daily basis throughout the year, whatever the weather! It offers a fantastic range of learning opportunities and first hand experiences including; ride on toys, rope swing, play house, ball games, imaginary play, exploring and investigating, water play, mud kitchen, tree climbing, digging and growing, chalking and painting. We also have a daily rotation system, so a key group go outside for a 9.30 garden time with their key worker. 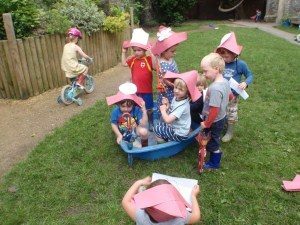 This provides an opportunity for them to truly explore the garden which lends itself to some wonderful exploratory, imaginative play, building strong group relationships. In the summer months, we stay outside for most of the day as the garden has lots of shady spots to enjoy a quiet story or a refreshing ice lolly! We even have music sessions outside sometimes using natural resources and release our butterflies which is a memorable experience for the children.